Those that know me, know that I’m a passionate advocate for Craft Beer. Something though has irked me for a while. There is a sense of elitism, and excuse the pun, snobbery taking hold in some quarters. No different to how wines were promoted in the 80s. To me this doesn’t serve the wider industry well if we focus on one single segment. The 1%. Which is the current market share of Craft Beer in the Republic of Ireland. Confirmed by the recently published report on the industry by the Independent Craft Brewers of Ireland. Like any industry that is growing you will see rapid expansion, but ultimately the brewers of this country need that one percent to grow and for that to happen, good beer needs to become more accessible and available to your average person who may not have enjoyed a craft beer before. This is why Lidl’s recent foray into the sector is very welcome. 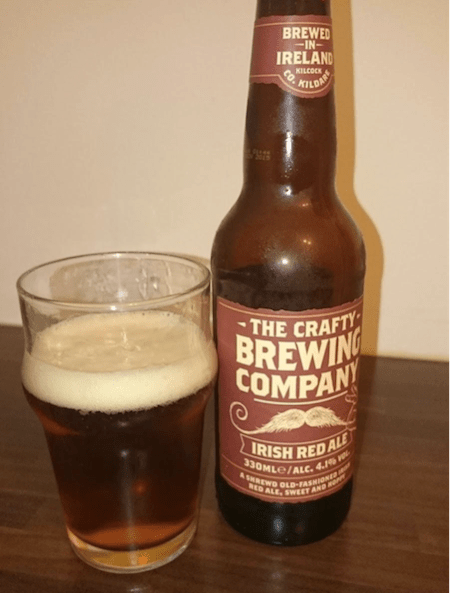 They have partnered with Rye River Brewing Company, based in Kilcock, Co Kildare, to bring a range of craft beers to consumers under the brand of “The Crafty Brewing Co”. As we all know the last several years seem to have been a relentless pursuit in austerity and people have been searching for better value for money. What we have learned though is that cheapest doesn’t necessarily mean best value. We see evidence of this every day in Lidl with the range of produce they offer at reasonable prices. So what have we got here then. Simply put, Lidl has put together three of the most popular beer styles in this country. Lager, Stout and Red Ale together in nice 4 packs. They are available for €4.99 per pack. 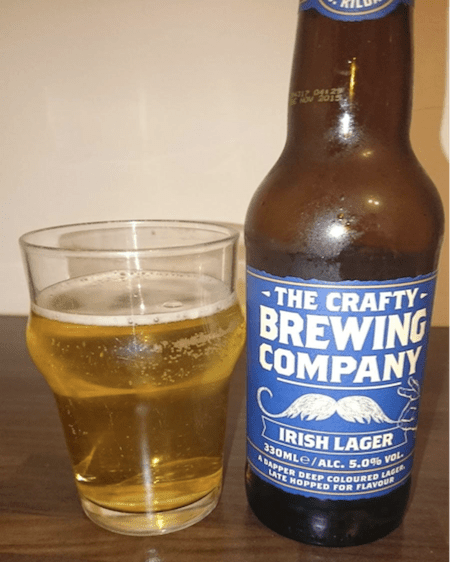 This is an Irish Craft Beer, made in an Irish Craft Brewery. That in my view is simply good value for money when you consider how much of this money actually goes back into the local economy as opposed to the large multinational brands we have in this country. First thing that strikes me is the labelling, its pronounced clearly & proudly, made in Kilcock. But even the name and mustaches poke fun at some aspects of the craft beer fans. On each label there are tasting notes too which are helpful for people who want to understand what the brewer is trying to convey with each beer. First up is the Lager. Weighing in at 5%, it is a little stronger than what most mainstream lagers would be. Here we have a lager that pours that familiar straw colour that people will be used to, you get a citrus aroma on the nose when poured. The beer is mildly carbonated which is a refreshing change to the extra fizzy lagers we may be used to. The palette has a nice crisp taste and is quite refreshing. To me this would work well with a mildly spiced curry, either Indian or Thai. Next up we have the Red Ale, this is weighing in at 4.1%. This will be less bitter than the lager. It is quit biscuity on the nose, and I get digestives mixed with slight fruit. It pours a deep amber colour, with appropriate carbonation for the style. The flavour is malty with a nice slightly dry finish. This would work really well with white meat dishes such as pork, or chicken. As I was drinking it I was thinking a nice Chicken, Bacon & Leek pie would be perfect with it. 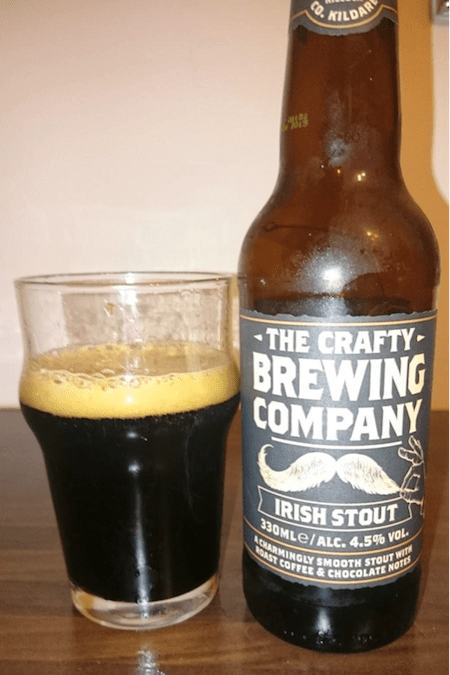 Last up we have the quintessential Irish Beer Style, Stout. This style of beer is globally linked with Ireland, and always will be. The ABV is 4.5%. This pours a lovely black colour with a slight ruby tinge and a head that is a coffee crema appearance. Once you stick your nose in you get that unmistakable coffee aroma, like someone has poured coffee into your beer. There is also a hint of chocolate on the nose. When you take a mouthful can pick up that coffee and chocolate flavour balanced with a lingering bitterness on the palate. Stout is a great beer for these dark winter nights, and this would be good with a Steak Pie, or game like Venison. These beers are now available Nationwide.